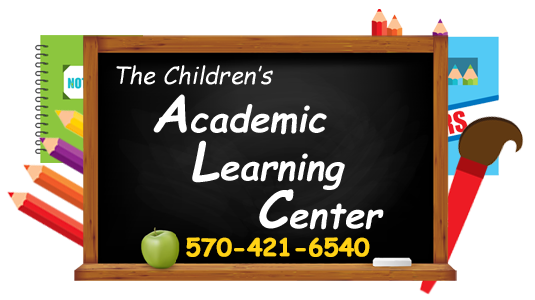 The Children's Academic Learning Center curriculum consists of 10 areas of concentration. Every year since 1985 the Children's Academic Learning Center has been visited by some very special green friends. This clip from a local news station shows how our students use skills such as problem solving and creativity to try to catch a leprechaun! Our curriculum includes a variety of different areas of focus including Social Studies, Visual Arts, Science, Handwriting and more. -are fostered when children have the spontaneity and encouragement to express their ideas verbally, and in written or visual forms and by listening to, sharing, and enjoying stories, poetry, and plays. -comes through many informal and planned activities. This includes reciting the alphabet, recognizing letters and letter sounds, rhyming words, listening comprehension, following directions and giving the love & appreciation of books through stories and picture reading. -can be developed through working and playing with blocks, clay, modeling, finger painting, and coloring. As children begin to show a desire to print, they are taught the correct letter forms. The child is encouraged to use his/her natural hand preference for all hand work. -is acquired through group activities and planned experiences which occur in games and discovery. This includes recognizing and understanding the meaning of the cardinal numbers from 1 to 10, learning about the simple concepts of addition and subtraction, the calendar, telling time, money, measurements, sets, equivalence, and geometric shapes. -children learn about people as they follow their interests in school, the community , and during holidays. -concepts are integrated into the program in a functional manner as children begin learning about body structure and function, personal cleanliness, family life, and dental health. -provide experience in which children sing, listen to recordings, use rhythm band instruments and respond creatively to music through bodily movements. -increases children’s awareness to observe their environment. Using their senses, children experience the natural world through experimentation, observation and discovery about plants, animals, weather, and seasons. -provide another channel for creative expression as children paint, draw, print, sew, model, construct materials, and engage in other related art activities. - movement is an integral part of young children’s growth. Children should progress at their own rates in developing physical skills, learning to move body parts, and developing a positive self-concept as skills and competencies become noticeable.